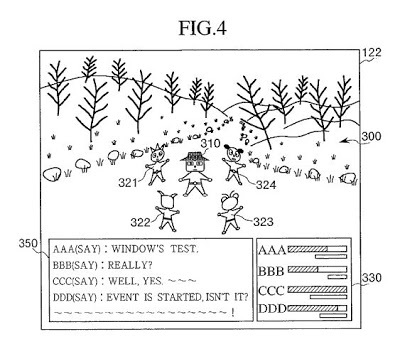 The ’035 patent should appeal to anyone who enjoys playing online multiplayer games. This invention provides a way for multiple players to communicate during a game. The players are able to type text into the communication box and have it appear to the rest of his teammates. The text scrolls upward so that older messages make way for the newer ones. The older texts stay around for long enough that the player has a chance to read it first. The invention also calls for accomplishments to be acknowledged in the chat-text box. For example, if the player gets an ‘x’ number of kills (which is an accomplishment), the others players will be notified of this accomplishment via the text box. This invention was implemented in the game Quake 3 Arena. Multiple video game apparatuses are connected to a game server apparatus. This network game progresses when players of the respective video game apparatuses exchange messages via the game server apparatus. When a predetermined event is generated by processing in the game server apparatus, a specific message is transmitted to each video game apparatus. In a chat window provided on a display screen of each video game apparatus, the message sent from the game server apparatus is scrolled and displayed from the bottom to the top. When the specific message reaches an uppermost portion of the chat window, a lock window is set and the specific message is displayed therein. The specific message in the lock window is not erased by the reception of a next message. 1. A network game system having a server apparatus and a plurality of client apparatuses each connected to said server apparatus via a network, said server apparatus comprising: a server message receiver that receives messages from each of said plurality of client apparatuses; a server message transmitter that transmits messages on progress of a game including the messages received by said server message receiver to each of said plurality of client apparatuses via the network; and a specific information transmitter that transmits specific information when said server message transmitter transmits a specific message, the specific information indicating that the transmitted message is the specific message, each of said plurality of client apparatuses comprising: a message input device that inputs a desired message on the progress of the game according to a user’s operation; a client message transmitter that transmits the messages input from said message input device via said network to cause said server message receiver to receive the messages; a client message receiver that receives messages transmitted from said server message transmitter; a specific information receiver that receives the specific information transmitted from said specific information transmitter; a message display device that displays messages received by said client message receiver within a chat window while scrolling the messages sequentially; and a display controller that controls scroll-display displayed by said message display device such that the received messages are sequentially scrolled to erase an oldest message from the chat window, and display of the message corresponding to specific information received by said specific information receiver is prevented from being erased from the chat window by the scrolling a until a predetermined condition is satisfied, when the specific message is the oldest message and otherwise would be erased by scrolling in response to displaying a new message.